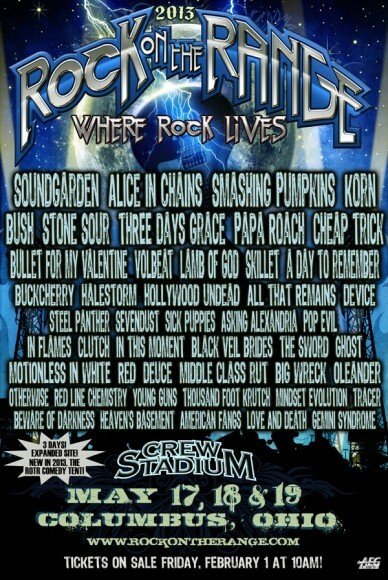 The newly expanded Rock On The Range has confirmed their 2013 lineup, including Soundgarden, Alice in Chains and The Smashing Pumpkins. Rock On The Range will be in Columbus, Ohio May 17-19. In it’s seventh year, Rock On The Range producers strived to up previous years’ shows. Not only have they announced a huge lineup, lengthened the festival by a day — previously two days — but they have also secured Soundgarden, who have not performed in Ohio in two decades. “This massive lineup has scratched our seven-year itch!” said Gary Spivack, co-executive producer of the event for Right Arm Entertainment. Rock On The Range is also expanding the entertainment this year. The Funny Bone comedy club will have a tent where comedians will “riff on the rock experience,” according to Joe Litvag, co-executive producer of the event for AEG Live. Rock On The Range will again be held at Columbus Crew Stadium. Pre-sale tickets are available and tickets to the general public will go on sale February 1. VIP Package deals and hotel and ticket combinations will be for sale.